The best thing about Ocooch is their attention to detail. 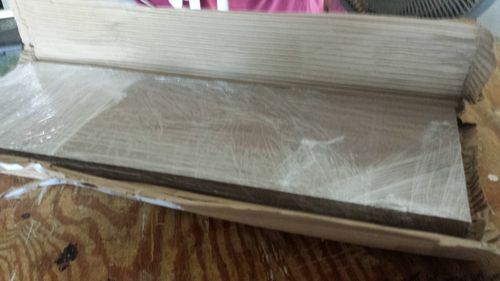 Here is how your wood arrives. 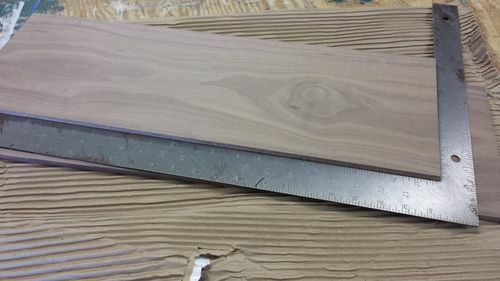 It’s always sanded on both sides and usually square all around…I’ve not had a piece that wasn’t fixed with a just a quick sand in one or two spots. I ordered this at 3/8” and of course that’s what I got. 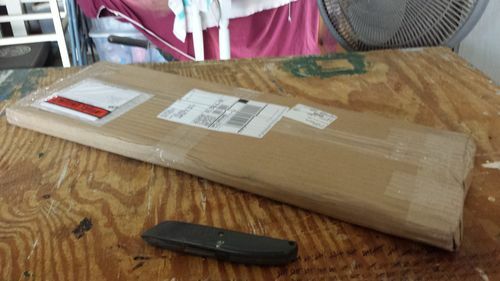 Not too much wiggle room, but a little…I ordered 8” and got about 8 1/16”, seems to be the average i get. Same thing on the length. I ordered 24” and usually get 24 1/6” or 24 1/8”. And finally, a quick wipe with Mineral Spirits shows how beautiful it will look. 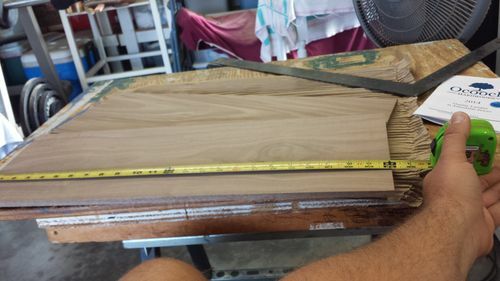 Hope this helps some of you and keeps you from looking for hours like I did before you take the plunge and find a place with reasonable prices that you can trust to get quality woods. How are there prices? ? and shipping cost ? Rusty nailed the question of the day in one try. 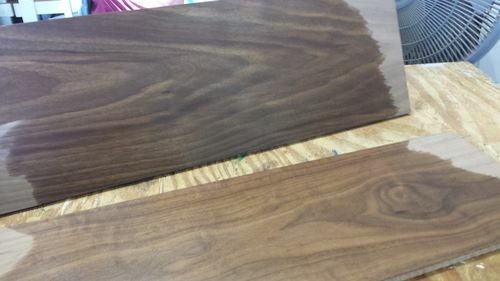 it looks like the 3/8” X 8” X 24” walnut is $26 a bf! i don’t mean to be rude chuckv but your calculations are not quite correct. the cost comes out to $8.71 per board foot by my calculations. I’ve been wrong before and I could be wrong again! 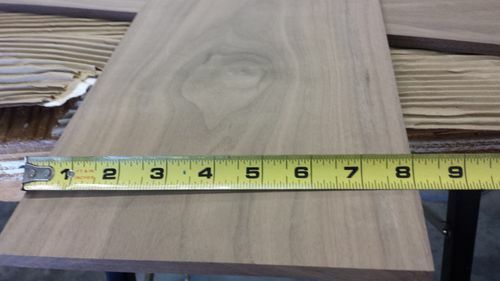 The web site lists the price as $13 for 3/8” X 8” X 24”. In bf, this is (3/8 X 8 X 24) / 144 = 0.5. At $13, the cost is $26/bf. Thanks for the heads up. We are pretty lucky here in Houston area. We have a few wood suppliers locally that I can call on for supplies. But, most of it is not finished and needs some work. Are their delivery times pretty good? I think I usually end up paying a flat $11 for shipping and if I remember right, it’s usually here in 3 or sometimes 4 days, which isn’t too bad for clear down here in south Florida. So yes, the wood may be more than other places, as others above pointed out. However,I mainly do small projects and am happy to pay extra for quality wood I know I can always get. Also, paying at least half for shipping and receiving it in less than the 10 days I was getting it from the other places isn’t a bad deal either. 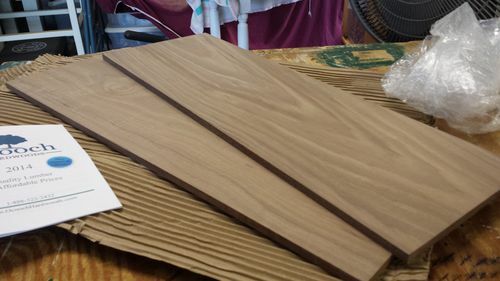 I just made my first purchase from Ocooch this morning and cannot therefore comment on their quality, although I know that they are very highly regarded among the scroll saw folks. That said, I feel compelled to add a comment to this old thread to defend the $26/bf cost. I live in DC and I have been to every hardwoods retailer in the DC area to my knowledge. Not one of them consistently stocks thin stock to a point that you could feel confident going by that they would have what you need. I can only think of one that even consistently stocks a fair amount of thin stock at all. And, while this particular place has pretty good prices overall, if you look at their thin stock prices and calculate by bf, you would see that they also seem quite high by the bf. I suspect this is normal as thin stock is a specialty item and takes more work to make (and creates more waste). 1. Hope that the one place has what you need. 2. 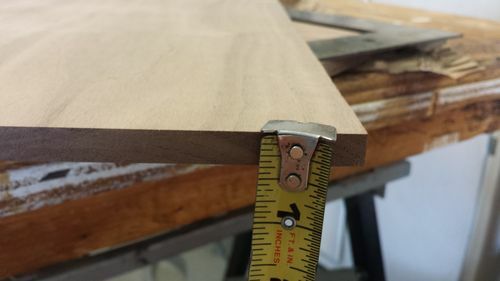 Pay the hardwood retailer to make the thin stock for you, which means incurring possibly substantial shop charges. 3. Make it yourself from rough lumber, planing, resawing, planing again, possibly drum sanding. This is a great way to save money but it is also a lot of extra work. 4. Order from a place like Ocooch and have exactly what you want delivered to your door. Most projects that need thin stock don’t require that much of it so going through options 2 or 3 just to get a few square feet of 3/8” Padauk or something just doesn’t seem practical to me.